Both epoxy and hybrid polymer floor coating paints are designed with tough finishes that stand up to the heavy traffic of both commercial settings and residential garages. The floor coatings have been used for over the past 30 years in automobile repair shops, gas stations, industrial or manufacturing settings, retail and commerce buildings, and most recently in basements. 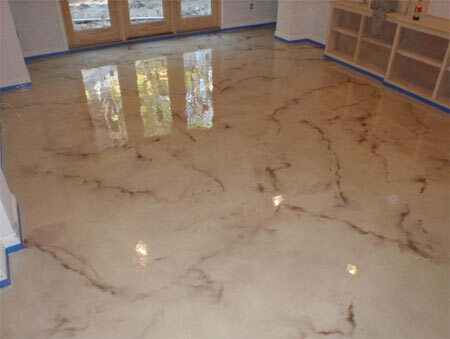 Epoxy floor coatings are durable, attractive, and available in an almost unlimited colors and styles. Aesthetically-pleasing floor options available in a variety of textures and colors; evenly distributed, slip-resistant, final coat preparations; and high-gloss shine that enhances lighting. Easy cleaning and maintenance with high chemical and stain resistance. Most times cleaning with a garden hose is sufficient. If necessary, a mop or foam squeegee with a dilution of ammonia water, can be used. Soap products should be avoided because they can leave a residue that may become slippery when it becomes damp or wet. High quality, lasting beauty, and durability with up to a 10-year warranty. While epoxy floor coatings are still the most popular choice, the latest development is the introduction of hybrid polymer technology floor paint coatings. Depending on the application, hybrid polymer floor coatings can be the better option compared to epoxy floor coatings. Depending upon weather conditions and ventilation, installation time can often be completed in one day and ready to use without restriction. Hybrid polymer coatings also offer UV resistance, superior abrasion and chemical resistance, longer-term durability, less maintenance, and better shine. Whether the objective is concrete protection in your garage or looking for a durable and attractive flooring option in basements, homeowners will be pleased with the quality and ease of maintenance with either epoxy or hybrid polymer floor coating. Tip #12. What are Carbon Fiber Reinforced Polymer (CFRP) materials? CFRPs were used in the aeronautics, space, maritime, defense, and automotive industries because they are lightweight, with a tensile strength stronger than steel. Recent years allowed the development of CFRPs suitable for residential, commercial, and industrial construction applications, as well as adaptations for seismic-strengthening in roads and bridges.